If you are one who believes “trust” is fundamental to every good team, company or relationship, you may want to study the graphic above and commit it to memory. 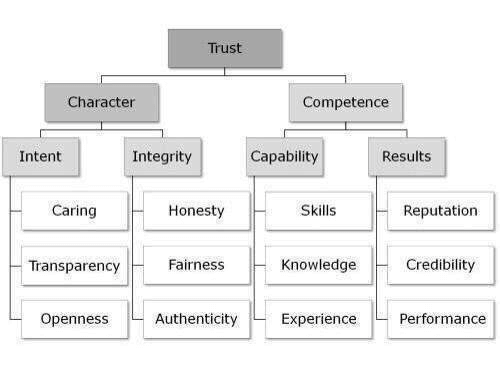 It’s a good blueprint for assessing why trust exists. Or why it doesn’t. We trust competence. We want our surgeons to have many completed surgeons under their belt. We want our coaches to have winning records. We want to have colleagues who have been “in the hole” before and know how to get out. We trust teammates with proven skill. We trust people who know the path to follow. Experience matters when it comes to trust. Character also matters. This graphic starts with “intent”. Do we care for each other? Are we open with each other? Is the information required to do my job readily available? Trust is built when we are transparent with each other. We are also trusted when our integrity is in tact. When there is a record of honesty, trust grows. When fair dealing is the way resources are allocated and disputes are resolved, trust grows. When the way people act on a team is free from politics and filled with straight talk, trust exists. Study up on this. If you find yourself not being comfortable, see if you can pinpoint the thing that’s out of whack. Maybe your considerations and a vow to do something about it can move you along.